An FDR Democrat who got big things done, the retiring senator has been a rare moral voice in a chamber of compromise and cynicism—especially on human rights issues. Tom Harkin’s decision to retire from the Senate at the end of his current term will create an immeasurable void in the chamber where he has served for more than a quarter-century. A progressive populist with a history of defending organized labor, working farmers, public education and public services, the Iowan arrived in the Senate as a fighting FDR Democrat and he will leave as one. A variety of terms have been used to describe Harkin’s politics. He has been called a progressive or a populist from the prairie school. He is that but more: He was a close friend of the late Minnesota Senator Paul Wellstone who used to say he belonged to the Democratic wing of the Democratic Party, meaning he was not ashamed to be called a liberal. That’s the same wing of the party Harkin has represented without apology. Actually, Harkin’s politics and his philosophy of government are rooted in the age of Franklin Roosevelt’s New Deal, which swept in a historic change in the role of government in the affairs of the nation. On a national political landscape that could use a good deal more of FDR’s ideological and political determination—especially in the updated and extended form that Harkin employed it—this is a retirement that will be felt by every American who recognizes that formation of a more perfect union requires the forging of a truly national, urban and rural progressive politics. Harkin has for almost forty years, first as a member of the House and then as a senator, represented a swing state with a Republican governor, a Republican senator and a competitive streak in presidential politics. Yet, he has won, again and again, and by ever-expanding margins. Elected to the Senate in the same year that Ronald Reagan won his second term by a landslide both nationally and in Iowa, Harkin has repeatedly bucked Republican tides and prevailed when more moderate Democrats have been defeated. His electoral success confirms the progressive premise that voters are more likely to back a determined Democrat than a compromising centrist. But there has always been more to Harkin than populist rhetoric and ideological clarity. He came to Congress to get things done: to end secret wars in Latin America, to keep family farmers on the land, to make workplaces safer and to enact the groundbreaking civil rights protections contained in the Americans With Disabilities Act. Many of his greatest legislative victories came when Republicans sat in the White House, most were enacted with Republican co-sponsorship. Harkin has always understood something that only a few other progressives—Wellstone, Russ Feingold, Bernie Sanders—have ever really “got”: that it is not necessary to sacrifice principles when organizing coalitions of conscience across lines of party and ideology. Harkin has consistently clung to an old faith in what politics could and should be. He speaks of morality, of right and wrong. And his colleagues know he is serious; so serious that they often put aside cynicism and cooperate to accomplish that which—and the ADA is a classic example of this—few thought possible. By 2004, Harkin was an enthusiastic, and because of his Iowa prominence, essential backer of Howard Dean’s anti-war campaign for the Democratic presidential nomination. Harkin would eventually become one of the loudest congressional critics of the war, and of the Bush administration’s abuses of power, joining with Wisconsin Senator Russ Feingold in a lonely effort to censure the president. When Bush nominated the noxious John Negroponte to serve as US ambassador to Iraq, the Iowan broke not just with the administration but with fellow Democrats to vote against a man who had been linked to human rights abuses in Honduras two decades earlier. Harkin battled, essentially alone, to hold Negroponte to account. The senator came full circle in the 2004 debate over Negroponte’s nomination. Harkin’s first big fight on Capitol Hill, as a young congressman from a competitive district representing rural Iowa, was to demand that the entire thrust of US foreign policy be altered. As a young congressional aide in 1970, Harkin had played a critical role in exposing South Vietnam’s abusive treatment of prisoners, who were held in so-called “tiger cages.” Horrified by mounting evidence of US support for right-wing coups, murderous dictators and torture states in southern Asia and Latin America, Harkin in 1975 proposed an amendment to the Foreign Assistance Act that prohibited the United States from providing economic aid to any country determined to be engaged gross human rights violations unless. The only exception was a provision that permitted allocation of US funds if could be proved that the money who directly benefit the most impoverished citizens. Presidents and their congressional allies invariably circumvented human rights responsibilities, to Harkin’s great frustration. As a new US senator in the mid-1980s, he joined another new senator, John Kerry of Massachusetts, in seeking to expose and end the Reagan administration’s support for right-wing dictators and death squads in Latin America. Others softened in their stances, but not Harkin. When Bush nominated Negroponte for the Iraqi ambassadorship, the senator from Iowa took to the floor of the chamber and recounted the dark history of the nominee’s “service” as Ronald Reagan’s administration gave lawless support to death squads and paramilitary murderers. Harkin accused the nominee of lying to Congress and the American people about circumstances on the ground in Honduras in the early 1980s—where 184 people, including an American priest, “disappeared” while Negroponte was ambassador to Honduras. 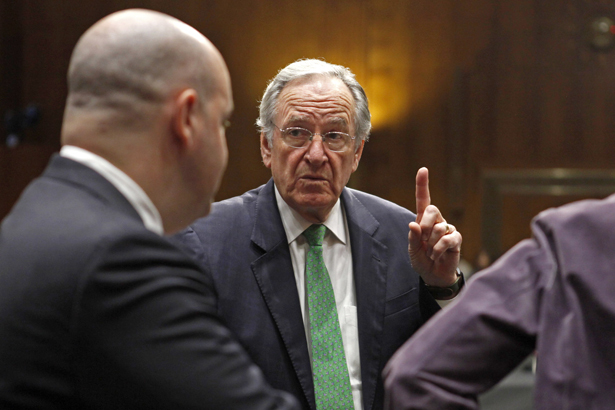 For Tom Harkin, it was not enough to amend the laws of the land to defend human rights. It was necessary to hold to account those who circumvented those laws. It was a conscience call. A moral duty. And for Tom Harkin, this has always been the point of being a senator. For those of us who know Harkin, and his record, this is our source of regret at the news of his decision to retire. He has surely given a full measure of service. But his kind is rare, too rare, in a Congress that will be deeply diminished by his departure. Chuck Hagel is also no favorite of foreign policy hawks, John Nichols writes.